Omnia Music Player supports almost all audio formats including mp3 ape aac flac opus ogg wav etc. It has high-resoutput engine with best sound quality and a 10-band equalizer within a small footprint less than 5 MB. Omnia Music Player contains almost every necessary feature to fulfill all of your musical needs including: gaplessplayback lyrics display crossfade play speed adjustment tag editing last.fm scrobbling Chromecast voice command Android Auto Freeverb audio balance ReplayGain sleep timer etc. 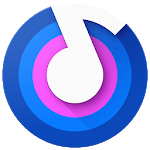 ✓ Manage and play music by album artist folder and genre. ✓ Smart playlists with most played recently played and newly added tracks. ✓ Fast search across albums artists and songs. ✓ Colorful themes fully customizable. ✓ Built-in audio engine decoder and library. If you can help to translate this audio player to your native language or there is any mistake in current translation please contact our email: support@rhmsoft.com. If you run into any issues or have any suggestions while using this audio player please feel free to contact us:support@rhmsoft.com. ✓ Fixed Chromecast playback issue when music format is not supported. ✓ Add Russian translation, thanks to Игорь Иринин! ✓ Add Turkish translation, thanks to Arda Şen! ✓ Some bug fixes and stability improvements.